Hello my lovelies! I'd love to take a little time and tell you about my skin. In my mid/late teenage years I really struggled with acne-ridden skin. This, coupled with being a bit overweight, meant that I also struggled with self-confidence. I didn't like my appearance at all if I'm being totally honest. I tried to over compensate by being the funny friend, or the trustworthy one who always ended up stuck in the middle of arguments! It wasn't until I was about to begin my first year at Uni that Mum and I sought out proper treatment for my acne. Looking back, had I known what I'd go through whilst taking this stuff ... I'm not sure I would use it again. It's a tough one though - the noticeable improvement in my skin gave me a boost in confidence, yet, ironically, my mental health took a beating. I became insanely jealous, overly sensitive, more moody (if that was even possible!) and felt extremely low at times. Hindsight is a wonderful thing ... it's only now I can truly see the potentially devastating side-effects the drug was having on me. I honestly don't know how Matt (my then boyfriend, now husband) stayed with me. I was unbearable at times. Totally and completely unbearable. My mood swings were off the scale and I acted like a maniac - that's putting it lightly. I was irrational and paranoid, over the most stupid things. I didn't like the person who I became while taking Roaccutane - actually, I don't even recognise her! Matt must have known he was in it for the long haul, enduring such ludicrous behaviours from me! I actually threw stuff out the window of our uni halls of residence at him (3 floors below) because I was having a 'moment'! 1. I was NOT taking any chances with regards to getting pregnant again. I had a terrible pregnancy and labour and was in no way ready to go through it all again! 2. I missed the 'control' I had over my body when on the pill. I loved having the choice to run through a packet and miss having a 'period' if I was going away or on holiday etc. Let me take you to just a few months ago ... I was in a season of learning to 'let go' of a lot of the 'control' I was exercising over my life. Phoebe was also just about to turn 3 and I would love for her not to be an only child! I had finished a packet of Yasmin (can I just say here that Yasmin is the only pill that really agreed with me - several others caused awful hormone swings and cramps!) and gone through my 7 pill-free days. I reached into the cupboard to get another packet and there was none to be found! I knew I had another few packets in the medicine box as I'd only recently been to the doctors and got my 6 month supply. Yet, they had mysteriously disappeared ... I knew instantly that I was having to make a decision. In that season, part of my 'letting go' also meant ridding myself of the hormone controlling 'protection' of the pill. in those moments, I submitted everything to God, praying that whatever happened ... it was him in control, not me. If I was to get pregnant again, then so be it. Even writing those words fills me with anxiety and fear ... but that's ok.
Coming off the pill, I feared that the acne would return, especially as I was also about to begin to use a new skincare brand - Boots own brand - Your Good Skin (YGS). My skin would be quite sensitive and from using Roaccutane, my mum got me onto Liz Earle skincare as it really helped my dryness. I fell in love with it completely, especially the Cleanse & Polish and Eye Bright. I've been using Liz Earle loyally for about 10 years. The products are simply beautiful. Scent, texture and branding are simply spot on. However, I would have to say, that it's definitely a luxury product, for me anyway, and more pricey than the high street alternatives. I was always happy to spend the extra, as I felt it was well justified and the products always lasted for ages. Yet, it's amazing how timely some things can be. Just as I was quitting my job and coming off the pill, a lovely insta-friend (Ydele, @ourlifeatthewhitehouse) asked if I'd be interested in getting involved with a brand campaign for YGS. I did a wee bit of research (as you do!) and thought it looked like something I'd genuinely like to try. YGS were running a 28 day challenge and I signed up to give it a good, honest go! I was kindly sent x4 products from the range and I excitedly began the challenge. If I'm being brutally honest ... I was more than a bit skeptical. Being a Liz Earle die-hard fan, I wasn't convinced I'd like anything else! I was also super nervous to see how my skin would react to not only a huge hormonal change coming off the pill, but a change in product. I used the YGS products religiously, morning and night, for the duration of the challenge. I instantly fell in love with the Balancing Skin Concentrate. It's smooth and silky on the skin, with that 'luxury-feel' I'd been used to with Liz Earle. I went from barely using make-up remover and moisturiser in the mornings, to taking much better care of my skin. As much as I never liked using make-up remover wipes, I now really like using the YGS ones. They suit me - I'm lazy! Far too often I've slept in my make-up (I know some of you are physically wincing at the thought!) but there is little I hate more than doing that before bed! Now, with the handy wipes - it's quicker and easier! Hurrah! And, get this ... I'm even using toner - twice a day! I must like this YGS stuff! I'm not needing to use my make-up primer either, so there's another little saving there. The biggest win for me though, of course, is that since I started using the range, I haven't had a single spot. Not ONE! I don't know if YGS is the sole reason for that, but while the going is good, I'll keep going! 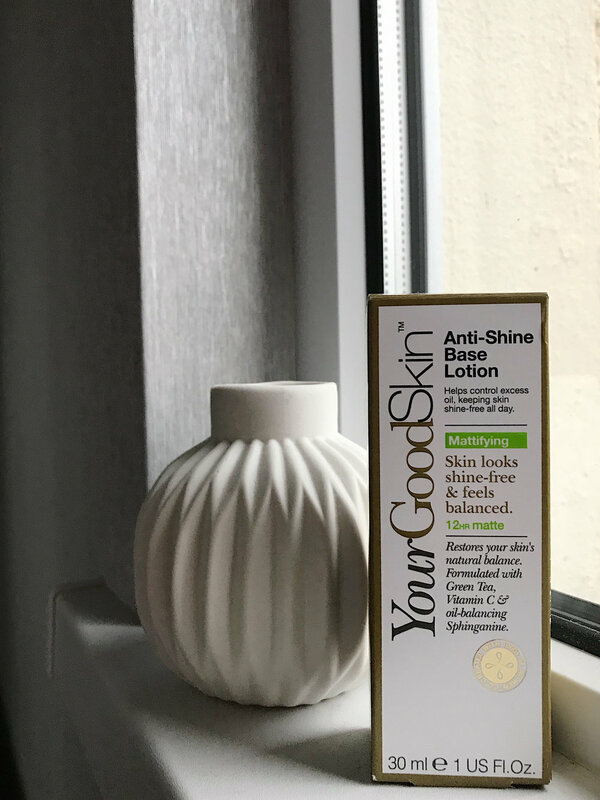 Use code YOURGOODSKIN2 for 50% discount! I know that this range mightn't suit everyone, but it suits me at the moment and is more affordable too! Sorry for the long post ... but hopefully it gives you a little insight into my skin journey. I also want to honour those running the YGS campaign, for generously sending me the products to try. I wasn't asked to do a blog post, just a little promotion through IG. This is genuine promotion of products that I've found really working for me at the moment and I'm hoping that someone else might enjoy using them too! "Motherhood looks good on you."